According to the latest tallies, Newt Gingrich has defeated Mitt Romney in South Carolina by 14 points, after trailing him by double-digits just a few days ago. Yes, that's pretty astounding. So what does this mean for those of us who study parties for a living? Newt Gingrich, conversely, is precisely the sort of candidate who should not win according to this theory. He has astonishingly little support among Republican insiders. (Indeed, the opposite: Republican elites have gone out of their way to trash him.) He has little money. He is sustained only by his savvy use of the media. Previous candidates who have attempted this path to the nomination include Jerry Brown '92, Howard Dean '04, Gary Hart '88, Mike Huckabee '08... basically, the really interesting losers. No one has pulled this off, really, since Jimmy Carter in '76, and that was before party insiders had learned to master the post-McGovern-Fraser-reforms system. So, as I've said before, this contest is turning into a fantastic test of the Cohen et al. thesis. If Gingrich were to somehow win the nomination, that would be pretty astounding, and we'd have to say that the system has changed. 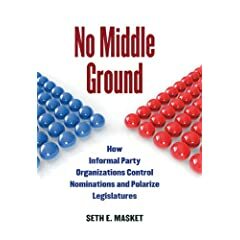 Perhaps the overwhelming number of debates changed the dynamic, and party insiders didn't control those as well as they can control primaries. Perhaps the rise of Super PACs made a difference, allowing a very, very small number of eccentric wealthy people to have inordinate influence over the contests. Again, my assumption is that the system has not changed significantly, and that party insiders will rise up again to crush Gingrich as they did back in December. And Lord knows they have the material to do it. But at the very least, this is already becoming a more interesting contest than most of us predicted. Update: For more on this topic, be sure to check out Nate Silver's post, although you probably already have. I haven't read the theory paper (Zaller Bawn) in a while, but it's late and I'm not going to bother and quote it...but doesn't this SC race violate some assumptions of their model about preferences in voting? In the usual case you vote for the candidate you think will win in the general. However, the media is crowning Romney as a winner, perhaps leaving many conservatives to vote sincerely to continue the primary. The Party Decides I think is more flexible on this point, in that eventually even though Romney will prevail it doesn't mean he can't lose every once in a while. Neither work assumes that the insider favorite will win every primary. Being the insider favorite simply means that you have the resources, expertise, and backing to be competitive everywhere and to withstand some local setbacks. Huntsman, by comparison, made a stand in NH and then had nothing else to stand on when he underperformed there. Also, neither work suggests that voters will coordinate on the candidate they think would win in the general. They do suggest that voters will largely end up backing whomever the insiders have coordinated on (assume they have coordinated on someone). Electability is certainly an important concern in picking a candidate, but it's not the only one. Insiders also prefer a candidate who will deliver on some policy goods. Otherwise every party always nominates Lieberman. Following the Newt Gringich win, I watched some George Wallace tapes from his runs in 1968 (as a Dem) and his run in 1972 as an Independent. Very little daylight between the Gringrich and Wallace rhetoric. Before 2010, how often had solid conservatives been knocked off in GOP primaries? It seems that the present day GOP base is exceptionally disaffected from the party elite - not just grumbling as usual, but outright rebelling. So perhaps this is a year when the standard pattern won't apply. Or Newt could just be one of those boomlet things, premature buyers' remorse, or whatever. But as I commented over at Plain Blog, if there's a year for the GOP to get weird, surely this is it. Do Super-PACs mean "Back to the Future" for campaign finance? Eugene McCarthy managed to fund his 1968 campaign with donations from a handful of rich people. Sounds like what Sheldon Adelson is doing for Newt now. looks like either Nate Silver is a fan of your blog or you just beat him to the punch in highlighting the implications of this contest for Cohen et al. 's thesis. a decent portion of his post yesterday morning tacked closely to yours. either way, here's to hoping the insiders don't crush Newt too quickly. this is simply too entertaining.